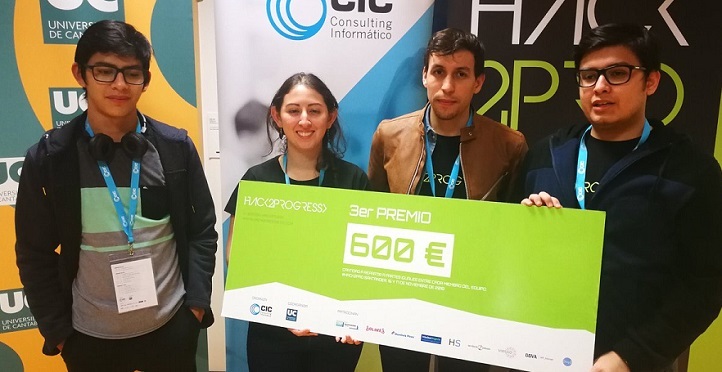 Four students of the degree in Computer Engineering of the European University of the Atlantic have won the third place in the technological competition Hack2Progress, organized by the CiC Consulting Informático company and the University of Cantabria. The team of students that obtained the distinction was formed by Kevin Ardón, Blanca Guzmán, José Caldeira and Carlos Padilla, who competed under the name of “Beggars Team” and developed an ingenious project called “Plugger”, which aimed to minimize “parasitic” consumption in connected electronic devices. These outstanding students worked hard for twenty-four hours to carry out their project, which stood out among the different participants, who were not only other students, but also professional physicists, mathematicians, designers and programmers. The effort of these young students was rewarded with a diploma, but also the third place earned them a check worth of six hundred euros. The Hack2Progress contest aimed to exploit the skills of competing teams in record-breaking speed. Therefore, the participants had a period of just twenty-four hours to design a project and execute it. This technological marathon, which celebrated its fourth edition, was carried out under the theme of “Cloud energy”, allocating different prizes for the most innovative and functional projects. A total of twenty-four teams signed up for the test, whose members received eight hours of training on Microsoft Azure and communication strategies during the days leading up to the contest. The degree in Computer Engineering of the European University of the Atlantic leads the students through the technological foundations that exist today until they are able to achieve a strategic vision in its application. UNEATLANTICO trains professionals who can solve problems analytically and strategically, and who are able to understand the fundamental principles that govern technologies.